Godaddy and Siteground are the two well-known and reliable web hosting providers. Both the web hosts provides cheap plans and good web hosting services. Though Siteground came much later than Godaddy in the market, it has made its place in the web hosting market and has been the first choice of many satisfied customers just like Godaddy. While Godaddy is US based firm, Siteground is a European company having its headquarters in Bulgaria. If you're looking for a reliable web hosting for your small business, personal website, or blog and confused between Siteground and Godaddy, this detailed Godaddy vs Siteground web hosting comparison is for you. In this comparison guide, we have compared both the web hosts on different parameters i.e pricing and plans, server performance, website speed, time to first byte, uptime history, and customer support. Godaddy and Siteground, both have been in the web hosting business for more than a decade now. This can clearly explain that they do not lack any experience in the field of web hosting. Both have specially designed plans for WordPress which cater the special needs of WordPress installations on websites. While buying any of these two hosts you might find yourself in a dilemma since both these hosts are pretty good and provide cheap plans with great features. Here we will compare all the plans and their features that these websites provide to their users. If you will have a closer look at the plans offered by both Godaddy and Siteground, you'll realize that they have been designed to cater different types of web hosting need. Both the web hosting providers have one plan where you can host a single website, one plan where you can host multiple websites that has low traffic, and one plan where you can host multiple high traffic websites. That means their shared hosting plans are categorized according to their increasing capabilities to host different websites ranging from lightweight to much heavier websites with high traffic. Here we will compare the hosting plans of both these websites side by side. The first plan of Godaddy is named as Starter and is actually for those who are new to website hosting or are just trying to set up a new website for the first time. This plan costs $2.49/month and provides hosting for one website along with 30GB of storage and unlimited bandwidth. This plans has support for the latest PHP 7.1 and also 7.0. Similarly Siteground has its basic or first plan named as StartUp which costs around $3.95/mo and provides hosting for one website with 10GB of SSD storage and also provides free SSL encryption for websites. 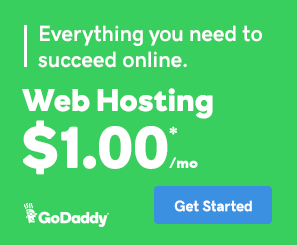 The second plan of Godaddy is Economy which costs $3.49/month and allows to host one website with 100GB of storage along with unlimited bandwidth and free emails for the first year and if you buy the annual subscription you also get a free domain. 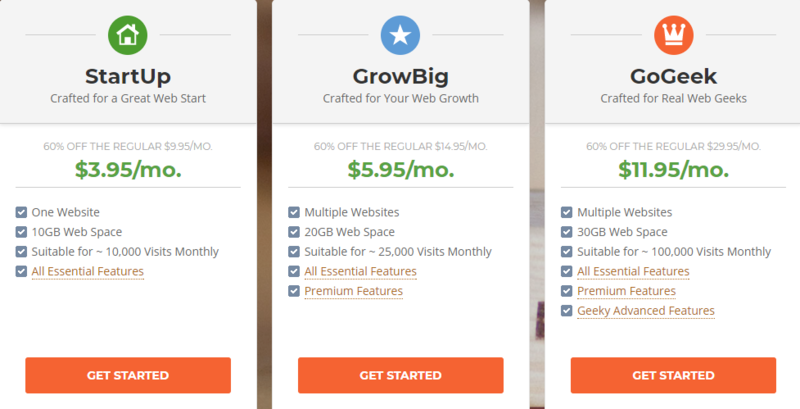 Somewhat similar to this Siteground has its next plan named GrowBig priced at $5.95/mo which allows to host multiple websites along with 20GB of storage. This plan also provides the facility to backup your whole website with just one click which might come in handy for many users. 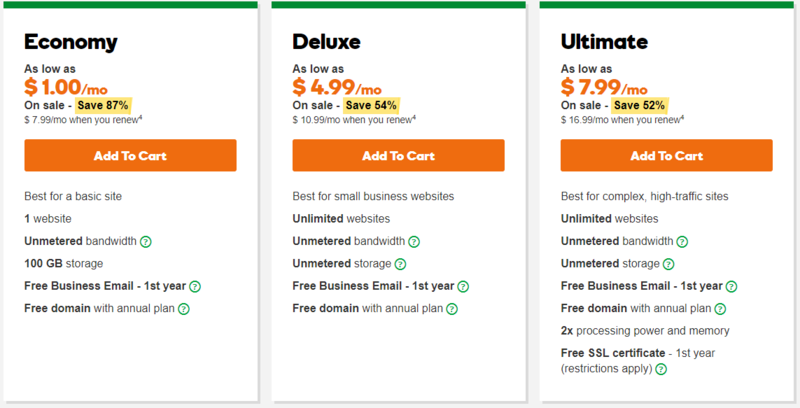 For a limited period Godaddy is offering their economy hosting plan for just $1 per month i.e 86% discounted price. The next plan of Godaddy is named Deluxe and costs $4.99/month which allows to host unlimited number of websites along with it, they provide unlimited storage with unlimited bandwidth. You also get a free business email for the first year of subscription. If you buy the annual subscription you also get a free domain. This plan is most suitable for those who own websites with moderate to high number of monthly visitors. Siteground has its GoGeek plan priced at $11.95/mo which provides hosting for multiple websites and 30Gb of storage space. It also provides free SSL and HTTP/2 certificates. You also get free email accounts with this plan. Comparing all these plans we can see that both Godaddy and Siteground provide pretty good plans for cheaper prices but Siteground doesn’t provide unlimited storage even in its higher plans which can be a drawback for many users. So if we consider this fact we can conclude that Godaddy has better and cheaper plans with better features. There is one more web hosting plan that Godaddy offers to their customers i.e Ultimate Plan. The plan provide 2X memory and power and cost $7.99/month. The plan is suitable for hosting high traffic websites. Performance of the web host is of utmost important since all you buy a web host is to host your website, and the performance of the website should never be compromised. Slow websites can cause in decreased visitors or at least will decrease in pageviews. A good webhost is that which doesn’t compromise anywhere in performance and deliver maximum performance irrespective of the type of website your are hosting on it. Here we will compare the performance of two websites side by side, one hosted on Godaddy and the other one hosted on Siteground. ​From the test results we can see the website hosted on Godaddy got a C+ grade while the one hosted on Siteground got a D+. 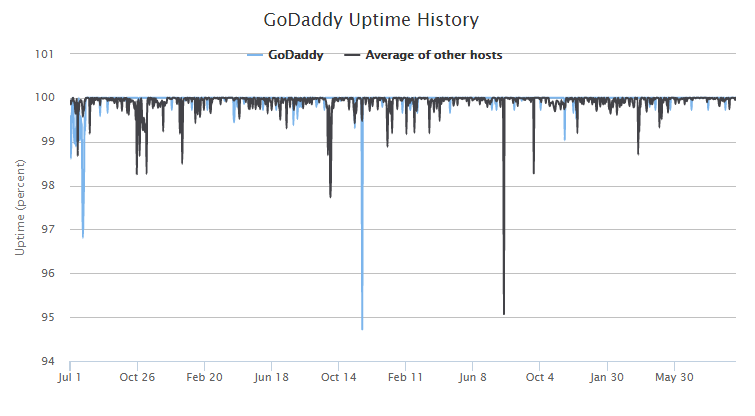 This clearly shows that in terms of performance Godaddy clearly wins. Comparing further we can see that the maximum time taken by Godaddy on any location was 340ms while the maximum time taken by Siteground was 748 ms which is almost double the time taken by Godaddy. 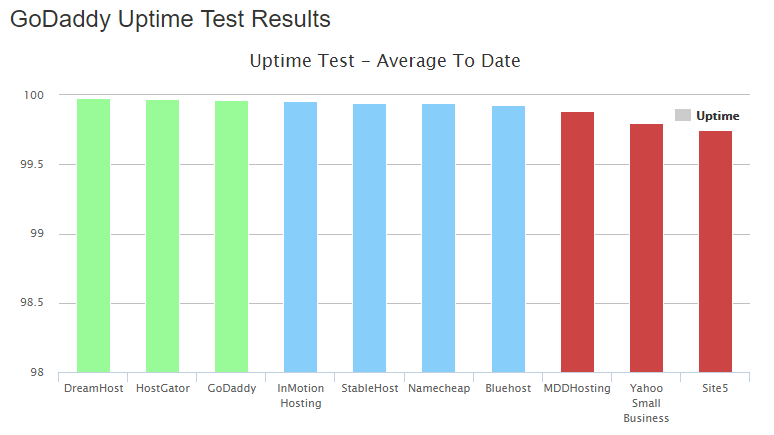 So in terms of performance Godaddy is the clear winner. Godaddy or Siteground - Which offer better website speed? With the help of these statistics we can see that Godaddy managed to get a 64 pointer while Siteground bagged 87 points in performance. This shows that Siteground performed way better than Godaddy. But since these performance test depend on many factors like server location, current traffic status, server conditions and many more. So just deciding a good or bad host on only the basis of Performance test is not justified. Time to first byte can be described as the minimum time required by the webhost to send or receive the first byte of data when requested by the user. Whenever anyone requests any data from a website, the host first receives the request and then processes it accordingly and sends the desired data back to the user. The time that it takes to send the first byte of data back to the user after receiving the request it termed as time to first byte. ​The TTFB results show that both the host got a performance grade 'C'. Although, if we look at the results closely, we'll find that Siteground has performed better than the Godaddy. 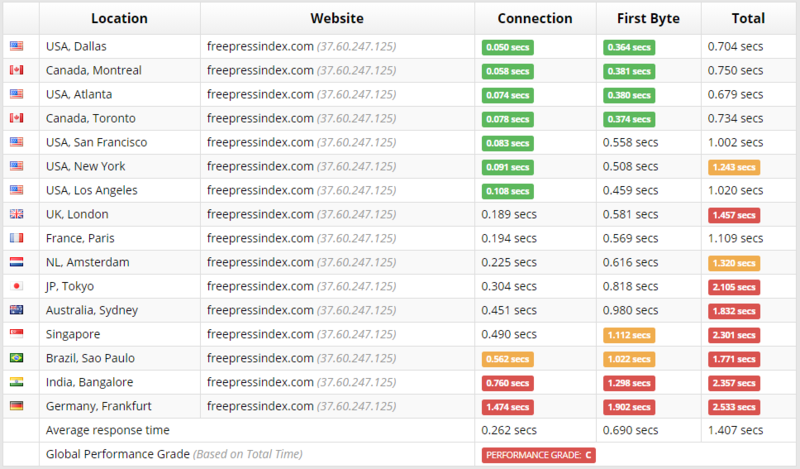 From many locations, the connection time of Siteground is lower than Godaddy. This clearly shows that Siteground has surpassed Godaddy in terms of time to first byte test and is slightly faster in terms of sending and receiving data. Uptime refers to the period of time for which the website or host is in fully working condition and usable. A good host is that which has maximum uptime and at least 99.9% uptime. While buying a webhost for your website always make sure that the host you buy should have a very good uptime record. Bad uptime may result in your website being offline for certain times depending upon the downtime of the parent host. 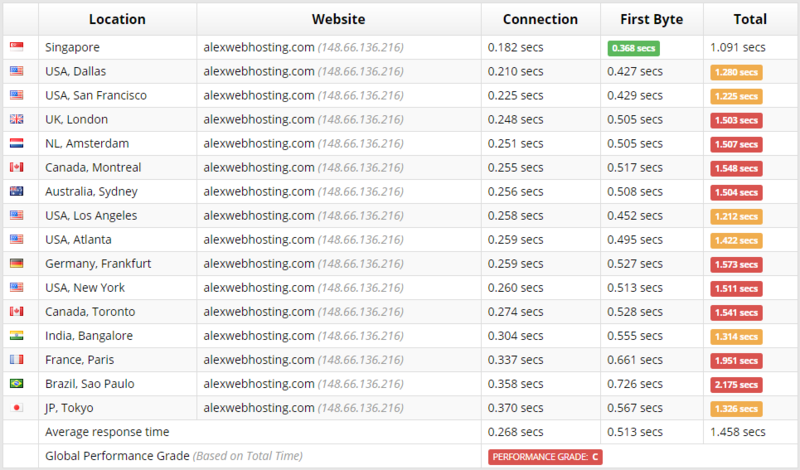 Here we will compare the uptimes of both Godaddy and Siteground so as to give a clearer picture of their uptimes. 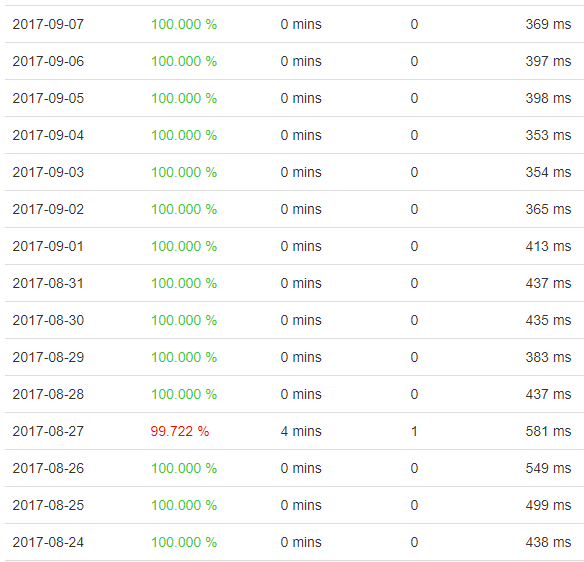 From the results above we can clearly see that both Godaddy and Siteground are offering more than 99.9% of guaranteed uptime. In some occasions, both Siteground and Godaddy has provided 100% uptime. So we can say that in terms of uptime, both Godaddy and Siteground are equally good. Godaddy or Siteground - Which Offer Better Customer Support? Performance and cheap plans are one way to consider a host as good, but a good host should also have good and responsive customer support. Siteground provides three ways of customer support. They provide customer support via telephonic conversation or you can just initiate an online chat with their customer support staff or you can raise a ticket for help and get your issue resolved in few hours. Similar to this, Godaddy also provides multiple various ways to seek support. You can directly call them up for resolving your issues. Godaddy also provides help & support in regional languages which is one of a kind thing. You can also use live chat option to seek help instantly or just raise a ticket for your issue and it will be resolved in no time. Godaddy also provides payments options in local currencies which is very much comfortable for those people who don't want to pay in dollars or just prefer local currency. Considering all the factors and points compared so far we can say that Godaddy has proven to be a better counterpart when compared with S​​​​iteground. Godaddy servers are faster compared to the Siteground and web hosting plans are affordable. Godaddy also proven better in terms of customer support as in many countries they have their local offices and can provide you support in non-english languages as well. You may also get an option to pay in your local currencies if you live outside the United States.